Cod is an ocean fish that produces thick, meaty white fillets. These fillets are suitable for sauteing or broiling, but they are especially well known for their crispy outside and juicy inside when they are fried. You must be very careful when you defrost cod because the fillets are deceptively delicate. Although the fillets look sturdy, they fall apart in water and overcook easily in the microwave. 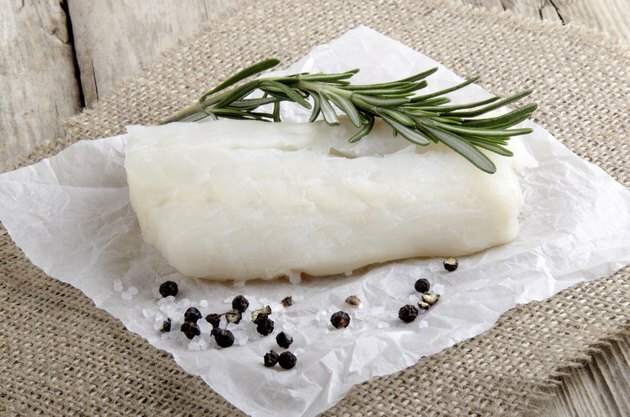 As a result, the best ways to defrost cod fillets is overnight in the refrigerator or under cool water inside a plastic bag. Take the cod fillets out the package and place them on a plate. Cover the plate in plastic wrap. Place the plate in the refrigerator on the bottom shelf so the cod doesn't drip water onto your prepared foods and contaminate them. Allow the cod fillets to defrost overnight. Press the cod fillets gently to determine if they are thawed. There should be no hard, frozen spots. Prepare the cod fillets as your recipe directs. Take the cod fillets out of the packaging and place them in a large, resealable plastic bag. Place the cod fillets in a large bowl or a clean sink and immerse them in cool water. Change the water every 30 minutes to ensure that the cod defrosts. Squeeze the cod fillets to make sure they are thawed completely. They should be firm but have no hard frozen spots. Prepare the cod as directed by your recipe. Do not refreeze thawed cod without preparing it first. Refreezing thawed cod will affect the texture, and if the cod sat in cool water, the holding temperature was above 40 degrees Fahrenheit, which may have allowed harmful bacteria to grow.